For the dairy (or beef) industry, the options for producing a late-summer emergency forage crop are limited, mostly because the growing season in Wisconsin is relatively short. Recent research has shown that oat, seeded in late-summer, can provide an excellent source of emergency forage before winter. However, this management strategy also has direct application to grazing livestock. Potentially, fall-grown oat can be used to extend the fall grazing season, especially throughout October and well into November, when the growth of perennial cool-season grasses slows. This Focus on Forage report will outline some of these management strategies that may improve the utilization of fall-grown oat based on recent research conducted at the Marshfield Agricultural Research Station. For more information about planting dates, cultivar selection, expected yields, and quality characteristics of fall-grown oat, please see Focus on Forage: Volume 14, No. 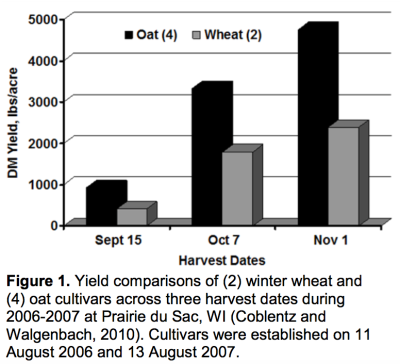 3 “Fall-Grown Oat Forages: Cultivars, Planting Dates, and Expected Yields” and Volume 14, No. 4 “Fall-Grown Oat Forages: Unique Quality Characteristics”. How is oat different than wheat or rye? Winter-wheat and cereal-rye cultivars planted in the late-summer will remain vegetative (do not joint) until the following spring. (These comments do not apply to true spring-wheat cultivars.) Unlike winter wheat and cereal rye, oat cultivars will joint, elongate, and produce a seedhead during the fall. This difference in physiology enables oat to enjoy yield advantages over winter wheat or rye throughout the fall. Specifically for a fall-growth application, triticale develops slowly, does not yield competitively with oat, and is not recommended (Coblentz and Walgenbach, 2010). Normally, fall-grown oat will produce more fall forage than wheat by about a 2:1 ratio, regardless of weather conditions or harvest date. This concept is summarized in Figure 1 from research conducted at Prairie du Sac during 2006-2007 (Coblentz and Walgenbach, 2010). While the additional fall forage produced by oat is desirable, it must be emphasized that all oat plants will winterkill, and all utilization by grazing livestock must be completed by winter. There should be no expectation of spring forage production without planting a new crop of oat or other desired forage; however, the near certainty of winterkill may eliminate some herbicide requirements the following spring before a new crop can be established. Alternatively, producers could consider mixtures of cereal grains, such as oat and wheat, to avoid re-establishment of pastures in the spring. This approach may limit fall forage yield, but would permit grazing of the surviving high-quality wheat the following spring (Oplinger, 2004). How do I graze fall-grown oat? Fall-grown oat should be considered stockpiled forage for deferred (later) grazing. Rotational grazing concepts are not applicable for two reasons. As stated previously, oat will eventually winterkill in Wisconsin. Secondly, fall-grown oat has very little regrowth potential. For these reasons, there is no need to worry about over-grazing, rest periods, maintaining plant growth reserves, or establishing rotational grazing schedules. The most complete utilization of fall-grown oat by grazing livestock will be accomplished by a one-time removal of standing forage, and by limiting the available forage to what is required to support livestock for a day or two at a time. This can be accomplished easily with a single ‘lead’ wire (Figure 2) that is advanced daily, or on some regular schedule. This allows livestock minimal opportunity to urinate and/or defecate on standing forage, or otherwise waste available forage via unrestricted foot traffic or by lying down (resting). Allowing livestock access to more forage will reduce labor, but this also will reduce utilization and increase waste. 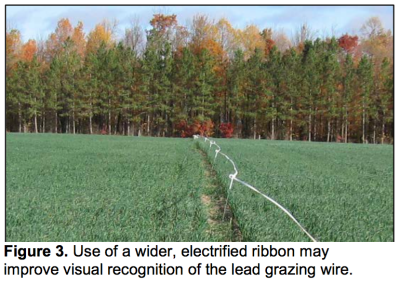 We also have found that attaching plastic streamers (Figure 2) or using a wider electrified ribbon (Figure 3) greatly improved recognition of the lead wire by the grazing cattle. Canopy height also will influence utilization of oat pasture. Table 1 illustrates this concept from two years of grazing data at the Marshfield Agricultural Research Station. During 2011, growing conditions were favorable, and plants reached more advanced growth stages and a maximum canopy height of about 39 inches. In contrast, climatic conditions during 2012 were much less favorable for growth due to extended drought, and oat plants were less mature, and considerably shorter in height, reaching a maximum of only 19 inches. 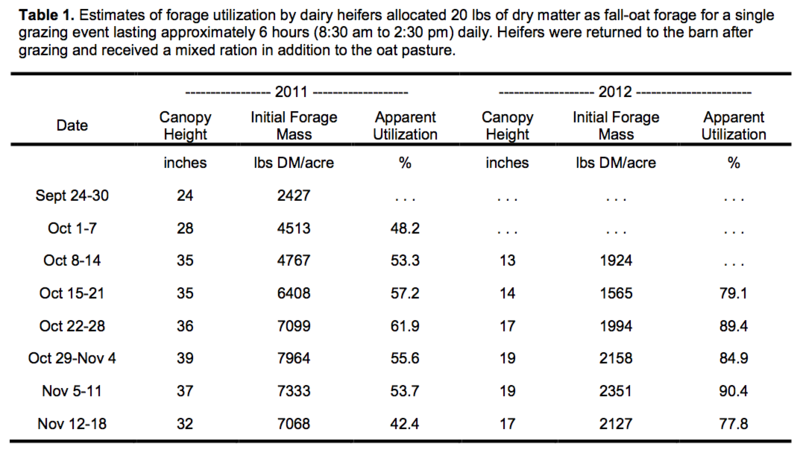 Throughout each fall, pasture was allocated to (~1100-lb) grazing dairy heifers at a rate of 20 lbs DM/heifer during a single (~6-hour) grazing event lasting from about 8:30 am to 2:30 pm daily. Heifers were returned to the barn for the rest of the day where they were supplemented with a forage-based total mixed ration. Apparent utilization of standing oat forage using these procedures varied between 42.4 and 61.9% in 2011, but was much improved (77.8 to 90.4%) during 2012 when plants were less mature and only about half as tall. During the grazing trial, the daily allocation of standing forage was set by the terms of the experiment, and not altered; however, livestock producers would have the option of adjusting the daily allocation of forage to partially regulate the percentage of forage refused. Dairy heifers in this trial also preferentially grazed leaf tissue, which has better nutritive value compared to stem; therefore, any decision to reduce the daily forage allocation in an effort to improve utilization of pasture (especially less-desirable stems) must be weighed against the potential for depressing animal performance. When should fall-grown oat be planted, and when can grazing begin? Fall oat should be seeded in central Wisconsin during early August (Coblentz and Bertram, 2012a). Using this timeline, grazing can be initiated during the last week of September during most years, which should coincide approximately with elongation of oat stems (post jointing). Fall forage production will likely be <50% of peak fall yield by that date, although it will continue to increase throughout October. If grazing is initiated too soon, livestock may consume available pasture too rapidly, without potential for significant forage regrowth. In contrast, delaying the onset of grazing too long may result in forage losses as a result of early snowfall events or other inclement weather. Fall-grown oat will tolerate numerous frosts, particularly if plants are at the stem-elongation or boot stages of growth, and recent studies at Marshfield suggest that grazing can continue until late-November if it is not prohibited by extensive snow cover. It also should be noted that plants mature very slowly (if at all) after mid-October, which is distinctly different than the rapid maturity changes that occur following a conventional spring seeding. Another unique management consideration is related to the low lignin concentrations commonly observed within fall-grown oat forages. Lignin concentrations are unusually low within fall-grown oat because growing conditions are cool (or cold), and normal maturation is disrupted by the decreasing day length. Structurally, lignin serves as the portion of the cell wall that gives plants rigidity, and allows them to stand erect. 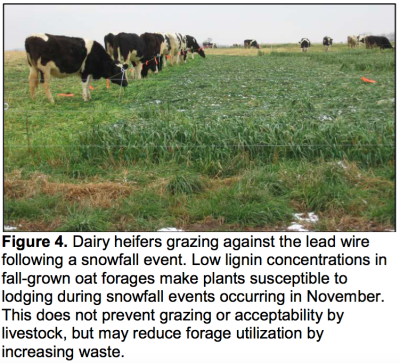 With reduced lignin concentrations, oat plants are prone to lodge during snowfall events (Figure 4); while this will not prevent grazing, it may reduce forage utilization, and obviously would eliminate the possibility of harvesting excess forage as silage. Lignin also is completely indigestible and serves as a major impediment to fiber digestion in ruminants; therefore, the risks associated with potential lodging during snowfall events are offset somewhat by improved fiber digestibility and greater energy density within the forage (Coblentz and Bertram, 2012b). 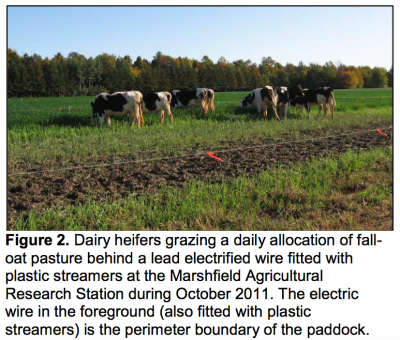 In the Marshfield grazing studies, how were dairy heifers trained to the electric wire, and adapted to grazing? In the Marshfield grazing studies, training of dairy heifers began approximately 2 weeks before the trial was initiated. Dairy heifers with no previous grazing experience were first trained to an electric wire placed inside a fenced corral with a concrete floor. Small groups of heifers were allowed access to the corral and the electric training wire for approximately 30 minutes. Each heifer participated in at least 2 such training sessions before they were allowed access to a closely monitored sacrifice paddock. During the week immediately preceding the grazing trial, heifers were slowly escorted to the sacrifice paddock via a centrally located drover’s alley. Care was taken to ensure that heifers were not allowed to run within the drover’s alley. Initially, heifers were allowed to adjust to the sacrifice paddock, electric wire, and initiate grazing for about 1 hour, which was gradually increased to 4 to 5 hours daily before the adaptation period was concluded. Heifers acclimated quickly to their daily movement from barn to pasture, and then back again, requiring only minimal labor within about 1 week. Fall forage production of oat generally will out-yield winter wheat or cereal rye by about a 2:1 ratio, regardless of weather conditions or harvest date. Primarily, this advantage occurs because oat plants will joint, elongate, and produce a seedhead before winter, while the other species always remain vegetative (do not joint) until spring. However, oat also will winterkill in Wisconsin, and has little potential for fall forage regrowth. As such, fall-grown oat should be considered stockpiled forage for deferred (later) grazing. Based on these characteristics, the best utilization of this forage will be accomplished by efficient, one-time removal of standing forage. A single ‘lead’ wire can be advanced daily to prevent trampling and waste, and to allocate forage daily based on producer management goals and requirements. In recent experiments conducted at the Marshfield Agricultural Research Station, pregnant dairy replacement heifers without previous grazing experience adapted quickly to this type of grazing management. Producers will need to evaluate the nutrient requirements of their livestock classes against the quality of fall-grown oat coupled with other harvested forages and/or supplements to meet their desired animal performance goals. Coblentz, W.K., and M.G. Bertram. 2012a. Fall-grown oat forages: cultivars, planting dates, and expected yields. Focus on Forage. Vol. 14. No. 3. University of Wisconsin Cooperative Extension Service, Madison, WI. Coblentz, W.K., and M.G. Bertram. 2012b. Fall-grown oat forages: unique quality characteristics. Focus on Forage. Vol. 14. No. 4. University of Wisconsin Cooperative Extension Service, Madison, WI. Coblentz, W.K., and R.P. Walgenbach. 2010. Fall growth, nutritive value, and estimation of total digestible nutrients for cereal-grain forages in the north-central United States. J. Anim. Sci. 88:383- 399. Oplinger, E.S. 2004. Small grains for fall and spring forage. University of Wisconsin Cooperative Extension Service, Madison, WI.